The Béarnaise sauce is amazing, make sure you try some with your fries. Hamborgarabúllan, or just 'Búllan' are burger joints in Reykjavík. The first one opened in 2004 by the old harbour in Reykjavík. It quickly became so popular that not only are there now seven different locations in Iceland, you can also get a Búllu-burger in Copenhagen, Berlin and London! All the locations have an authentic retro feel to them and entering feels like stepping into a time machine. The walls are covered with old film posters and pictures drawn by kids during their mealtime, and the ceiling is decorated with light sets. The menu values quality over quantity, there are no frills, but plenty of thrills. You can get three sizes of hamburgers; A normal 120gr (4,2 oz) Búllu-burger, a small 82gr (2,8 oz) búllu-burger, and a whopping double size at 164gr (5,8 oz). There's also a veggie burger that is famous for being the best of its kind in the whole city. If in doubt, go for the classic 'Offer of the century'; a mid-sized Búllu-burger, fries and coke. The Búllu-burger has been awarded the prize for best burger in the Reykjavík Grapevine magazine several times, to nobody's surprise. They only use the best ingredients possible, roughly ground top quality beef, cooked on an American gas barbecue. 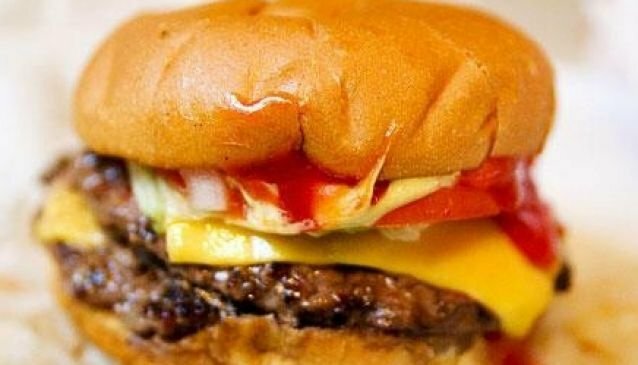 The burgers are all garnished with iceberg lettuce, tomato slices and chopped onions along with ketchup, mustard and mayonnaise. Don't miss Hamborgarabúllan while you're in Iceland.